Here is another very rare Oregon flask. This is the private mold variant in the pint size. Look at that huge, glob top. According to Dale, there may be only two known with an applied top, maybe 5 or 6 known with tooled tops. 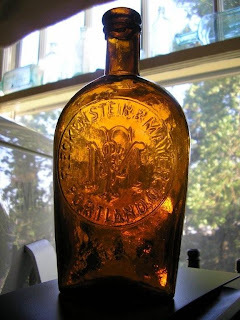 Fleckenstein and Mayer produced more early amber flask variations than just about any Western concern. There is the indented slugplate pint and 1/2 pint; the 'private mold' applied and tooled 1/2 pints; the 'private mold' pint in both applied top and toolie; and also the pint horizontal, open embossed, knife edge flask. There are also 3 known examples of the 1/2 pint with an upside down embossed slugplate! What is weird about the group is the overlap in usage. They were all made in the years between 1879-1885, several in use at the same time. That's a killer flask ! Looks like old Fleckie just couldnt decide which design he like best on his bottles... All those molds must have been costly. It's amazing how prolific the late 70's/early 80' were for glob top fifths and flasks. Slayer design, eh AP? I LIKE that one, even if it is from "Orygun".